Known as Snow Crabs, the Kreuzspitze binding toe pieces are some well-built pincers. The SCTT toes have strong steel springs that offer great retention. 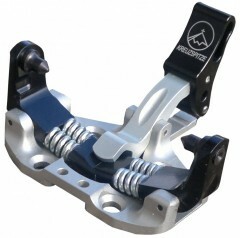 The SCTTT (that’s one more “T”) toes have titanium springs that make things a little lighter and more forgiving. Both feature a smooth locking mechanism with multiple notches for new versus broken-in tech fittings. The toe pieces seem to work especially well with La Sportiva boot soles, Kreuzspitze's Italian brethren. The toes are priced and sold individually, we recommend one for each ski. If you need some matching heels, look here.